Mettler Company - Quality Electronic Therapy Devices for Over 52 Years! SourceORtho is proud to be a distributor of the Mettler family of products. 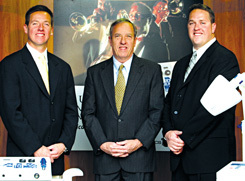 Hal’s son Stephen C. Mettler was, until recently, the firm’s President and Chief Operating Officer. Today his son, Mark Mettler, serves as President and heads up International Sales. Matt Mettler serves as Vice President and National Sales Manager. Hal Mettler introduced his company and groundbreaking Sonicator® 700 in June of 1957, with its unheard of price of $199.50. Because the new device was so affordable and portable, it revolutionized ultrasound therapy, making it readily available to a wide range of therapists and patients. With the new Sonicator, therapists could move the machine easily between treatment settings to reach any patient requiring therapy. It was an engineering breakthrough on the order of the transistor radio. Following the success of the Sonicator, a rapid succession of Mettler product innovations followed, including Auto*Therm® Shortwave Diathermy, Cavitator® Ultrasonic Cleaners and portable Muscle Stimulators. Hal Mettler was awarded a total of fifteen patents for his ideas. After Hal’s death, the firm maintained his commitment to innovation. Mettler Electronics engineering group continued to update and improve the products while maintaining an active new product development program. The result is a state of the art product line—with microprocessors replacing the original tube and transistor circuits—for enhanced performance and reliability.